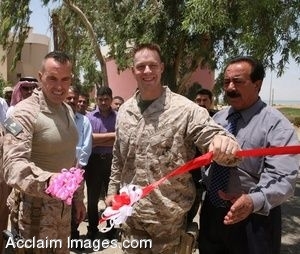 Description: Clip art photograph of Col. Vincent A. Coglianese, the chief of staff of the 2nd MLG (Fwd), and Maj. Christian M. Rankin, the commanding officer of Camp Al Taqaddum’s security detachment from 1st Battalion, 8th Marine Regiment, cut a ribbon at the grand-opening of a new restaurant and pool at Habbaniyah Tourist Village, June 1, 2009. The “village” is actually a resort built by the French in the late 1970s and was a well-known and sought after vacationing area for the region, featuring a 250-room hotel, a beach on the lake, amusement park, restaurants and nearly 500 small condo units approximately 90 miles south of Baghdad. Clipart photograph by Department of Defense Public Domain.